Before we start, it’s important to make two things very clear. First, Political Climate thinks that building new coal-fired power stations without emissions abatement is unwise on climate grounds. Second, we think subsidies for the capital costs of new electricity generation should now be focussed on renewables. But, as the unfolding debate concerning the building by Eskom of a massive coal power plant at Lephalale in South Africa’s Limpopo Province illustrates, simply holding such views is not enough. 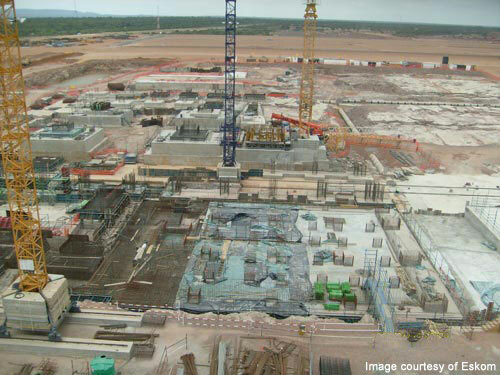 The plant (the above picture is its construction site) has been named ‘Medupi’ by state-owned Eskom. This apparently means ‘rain that soaks parched lands’ – perhaps unfortunate given the climate impacts of coal. At 4,788 MW of installed generating capacity, Medupi will be an absolute monster; reportedly the fourth largest coal plant in the world. Medupi is especially controversial, though, because it has been awarded concessional finance – a loan of $3.75 billion from the World Bank. Thus northern taxpayers are subsidising the construction of a large point source of carbon emissions (although part of this loan is said by the Bank to be for renewables). To add insult to the injurious feelings of those who campaigned hard against the World Bank loan, it seems Eskom may be able to claim Clean Development Mechanism carbon credits for the plant. Medupi will use supercritical technology and the CDM board has approved a methodology for higher efficiency fossil fuel plants (i.e. for claiming credits against a baseline of less efficient technology – in this case subcritical coal). Campaigners are understandably outraged. The World Bank’s defence of its loan, which presumably enables the project to proceed, or at least to do so at lower cost to the South African taxpayer, is less than 100 per cent convincing and throws up few surprises. South Africa, the Bank argues, has increased grid coverage massively in recent years but without increasing baseload. Medupi will help stabilise supply and meet demand and therefore it will benefit poor households. Notwithstanding the concerns in some quarters, about the structure of tariffs in South Africa, these are the same arguments the Bank has used for decades to justify involvement in large scale power plants and, carbon emissions aside, the opposition sounds similar too. When the loan was voted on by the World Bank’s board, the US, the UK, the Netherlands, Italy and Norway all apparently abstained, registering disapproval while not preventing approval. The US government spoke out against the Bank’s involvement, but political rhetoric was not in the end backed up by actions. The tale of Eskom’s mighty new coal plant, it’s subsidised loans and putative carbon credits merely illustrates how very far away our collective actions are from our rhetoric on climate change. Eskom could invest differently, but it is not in its commercial interests to do so; the World Bank’s main investors could more robustly re-purpose its energy finance but as yet they have not; the CDM board could have refused to approve a fossil fuel efficiency methodology (and have saved itself from ridicule), but it didn’t. At each step there is political as well as policy failure. Underscoring the whole debate is the inexorable quest for development. There may be very good micro arguments as to why Medupi is not a pro-poor power plant, but it is hard to argue against the logic at the national energy strategy level in countries such as South Africa that demands cheap, coal-fired power. Medupi is certain to be opposed every step of the way by campaigners – and not just those with climate change in mind. But if we are to avoid future Medupi’s, three things have to change. Development Bank-style lending needs to be focussed on helping to bring down the cost of capital for and injecting confidence into renewables sectors. The argument at the World Bank needs to be won so that the subsidy is switched to low carbon energy technologies. But debates over the Bank’s financing of energy projects are currently too polluted by calls for the institution to play no part at all in climate-related investments. A cleaned up Bank with its fingers in the climate pie would surely be better than a dirty Bank without. The next step on this is a smart political strategy to influence the Bank as it reinvents its approach to energy financing. Second, campaigners must wholly embrace the low-carbon innovation challenge. As we have argued in previous posts, hard-headed economic decisions will favour conventional technologies until innovation brings down the cost of new technology. So it really isn’t just a straightforward battle on the rain soaked parched lands of the Limpopo valley between clean and dirty technology as under the current rules of engagement, low carbon is likely to lose. Thus, in the context of coal, pushing hard for early demonstration of CCS at the kind of scale demanded by Medupi is the logical step beyond simply saying no to unabated coal. More broadly we need to develop and advocate for national and international (regional or bilateral rather than global) innovation policies that widen rather than narrow our technological choices in the future. Third, there needs to be a clear story to explain and guide policymaking. Arguing against projects like Medupi on climate grounds alone is demonstrably not enough. We need to construct a narrative that is closer to people’s immediate wellbeing to explain why low-carbon technology is necessary, especially for poor people in countries such as South Africa. The most worrisome thing about coal is the sheer quantity of it out there. The emissions we produce today accumulate, and remain in the atmosphere for a long time. Avoiding dangerous climate change requires leaving most of the world’s remaining coal unburned. It would make greater sense for the investment to be in renewables but this would probably only be practical with an infrastructure development of a high voltage DC grid throughout a major part of Africa. That should not be impossible but there are clear political and financial difficulties. Following reports on pan European HVDC grids from, amongst others, Gregor Czisch of Kassel University there was published an interesting article in the Scientific American, a few months back. Written by Mark Jacobsen and Mark Delucci, the article suggested that the technology already exists to harvest renewable energy many times more than sufficient to meet the World’s energy needs, within two decades – did the political will exist! It’s the will that’s missing and the still mighty lobbying power of the coal industry. Should the World Bank grant a $3.75 billion (R29 bn) loan to Eskom? No. We South African and African organisations which for years have advocated social and environmental justice here and abroad, oppose Eskom’s proposed Bank loan – and indeed its new construction programme more generally – for several reasons. •	unable to alleviate ‘energy poverty’, but instead entrenches suffering by imposing ‘cost recovery’ on people who cannot afford it, with Eskom already admitting a ‘typical township household’ will face a 2009-2012 monthly price rise from R360 ($48) to R1000 ($130). 2) Inappropriate financing. We therefore oppose all funding, foreign and local, for Eskom’s coal/nuclear expansion plans. Were Eskom to engage in a reasonable energy policy based on demand management, with supply shifting to renewable, and the expansion of Free Basic Electricity beyond the current tokenism as well as connections to urban shackdwellers and the rural poor, that would be worthy of support. As for green energy investments that are not import-intensive, local financing would be more appropriate than a World Bank loan – and is readily available, including through state debt and halting subsidised electricity contracts to multinationals. The financial danger of a World Bank loan is that the SA currency will crash (as it has five times since 1996), hence making repayment much more expensive (since the loans are not repaid in rand but in dollars), hence adding to the extreme cost burden poor South Africans will face. 3) Eskom’s special responsibility to Africa. We must not forget that South Africa consumes more than its fair share of Africa’s environmental space for development (more than 40% of CO2 emissions from just 6% of Africans), mainly because of Eskom, Sasol and other large corporations which emit the vast bulk of greenhouse gases. The World Bank loan will sink Eskom – and South Africa – into not only financial debt to the West, but much deeper ‘Climate Debt’ to Africa. African civil society unites with SA critics of Eskom’s irresponsible climate-denialist projects. 4) The World Bank’s special responsibility. Specifically, we oppose World Bank funding for Eskom and call on all governments with Bank voting power to oppose the proposed loan on April 6, when the Board meets. The World Bank has still not offered reparations for its 1951-67 apartheid-empowering loans to Eskom, for which only white people received electricity (but the entire society repaid the loans). Further, the Bank has consistently promoted privatisation and/or commercialisation of state utilities and cost-recovery (resulting in disconnections), which together prevent access to electricity by poor South Africans. We call on the Bank’s member governments and directors to endorse the recommendations of the 2004 World Bank Extractive Industries Review. The Review found that, aside from climate damage, the Bank’s fossil fuel projects had neither the intention nor the effect of alleviating poverty and called for them to be phased out. 5) The US government’s special responsibility. We especially call on the US Treasury – which has opposed Bank coal financing in line with a recent ‘Guidance Note’ – to veto the proposed loan, and to also halt US government subsidies to the coal industry so as to avoid the legitimate charge against Washington of hypocrisy. We are delighted about three processes internal to the US, which are a model for our own work in South Africa: Sierra Club legal action has prevented new coal-fired plants from being built; courageous activists in West Virginia are engaged in direct action to halt ‘mountaintop coal removals’; and the US Environmental Protection Agency adopted December 2009 provisions to implement its ‘endangerment finding’ that carbon from coal is a pollutant and must be directly regulated. What must be avoided is the US imposing responsibility for carbon cuts on the South, but without providing funding or technology support for renewable energies as part of the ‘Climate Debt’ that the US owes for taking up so much environmental space. World Bank Executive Directors representing the South have responded to the US Guidance Note making several of these points, and they oppose the use of the Bank as an instrument of US power. This is a fair point, and a long-standing grievance we all share, given Washington’s extremely destructive role at the Bank and in the world economy. Nevertheless, the dissident Executive Directors’ response supports further Bank funding for fossil energy and specifically coal-fired power stations, justifying coal as necessary for poverty alleviation and economic growth in developing countries. In reality, economic growth has been accompanied by growing inequality in South Africa and many other countries that suffer ‘resource curse’. The poor are mostly left worse off than before. Even where their income improves by conventional measures, the gains are lost to services cost recovery (and disconnections), to health costs imposed by pollution, to the loss of nonrenewable resources, to water/land theft associated with coal-fired power, and to the increased cost of access to amenities previously provided as public goods. In addition, it is common cause that the poor are most vulnerable to climate change. In many countries, they are already feeling the costs in intensified droughts and floods and in the loss of land through coastal erosion. 6) Towards the transformation of energy, production and financing. We see renewable energy, not coal-fired power stations, as the optimal development path for Southern economies, creating more jobs, building local manufacturing capacity, and avoiding the environmental mistakes of Northern countries. As in South Africa, most World Bank coal power projects are designed to supply industry, not people. They do not necessarily increase per capita access to energy. The industries in turn are mostly geared for export in line with the World Bank’s promotion of export oriented production. The goods are then consumed primarily in developed countries. Further, many industries are established with foreign direct investments. In the process, much of the heavy industry in developed countries has relocated to developing countries in search of cheaper energy and cheaper labour. Yet because their headquarters are in London, Melbourne, New York, Toronto, Zurich and other offshore sites, a substantial portion of profits is returned to rich countries, exacerbating the poor countries’ balance of payments deficit. Because South Africa’s payments deficit is so extreme, due to the outflow of profits and dividends to foreign corporations which benefit from the world’s cheapest electricity, The Economist magazine judged the country as the world’s riskiest emerging market (24 February 2009). 7) The demand side management alternative. Instead of expanding its coal/nuclear facilities, Eskom should engage in serious demand side management, beginning by phasing out electricity to smelters that have little linkage with the South African economy and that are capital- rather than jobs-intensive. Concrete plans should be made for a ‘just transition’, so as to provide alternative, well-paid ‘green jobs’ – e.g. in subsidised thermal-solar geysers for every house – to those workers who are employed at the smelters. At the same time, the special purchase agreements should be disclosed to the public and opened for renegotiation. The freed up energy should be redistributed to provide for a much larger ‘lifeline’ supply of universal Free Basic Electricity – with a rising block tariff to encourage conservation to improve spinning margins which will buy time for a switch into renewable energy technologies. By not expanding its coal/nuclear facilities and instead redistributing the electricity capacity it has, and by simultaneously switching to renewable sources, Eskom can survive this crisis. But it can only do so if it is not in the clutches of the world’s leading financier of climate destruction, the World Bank. •	Bulgaria	Bulgaria For the Earth! •	Mexico	Fundar, Centro de Análisis e Investigación, A.C.
•	Papua New Guinea	Center for Environmental Law and Community Rights Inc.
•	United States	Valley Watch, Inc.
ESKOM’s project is a typical example of the wrong use of natural resources. This could have been prevented if the project evaluations included environmental, social, economic and financial impacts. The problem is that because of a lack of foresight, ESKOM had to again fall back on the old method of power generation. The one thing South Africa has in abundance is low grade, sulphur rich, coal that can be used in these power generating facilities, Lephalale is a great place to locate this power station because no one in the cities see it. The World Bank does not have to live with its consequences and ESKOM makes a packet to pay bad managers. So to hell with the environment.